Passenger Restraint Kit with solid hand cuffs. A complete solution to the requirements for a PRS kit in the cabin and comprising all of the components necessary to manage and record restraint of a cabin security situation. All versions of the Cabin Restraint Kit (Rigid Handcuffs and cable ties) can be personalised and custom printed if required. They are also available with EASA Form 1 upon request. 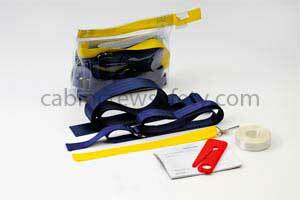 This passenger restraint kit with solid hand cuffs is supplied as un-certified representative training equipment. Looking for a Passenger Restraint Kit with solid hand cuffs for flight operations end use? We're here to help with all of your equipment needs. Not only with this Passenger Restraint Kit with solid hand cuffs but any other parts, equipment and reference training devices that you may require.